It had been quiet around here lately. I think people may be getting bored and not posting as much. I am trying to keep this board alive. I have been so busy lately and I have about 1 week left of studying for finals and finishing up my papers and stuff. But I am thinking about redesigning and sprucing up the board to help get posting up as soon as I have the time. I need some ideas. I know that Lumi is not on Days anymore, but that doesn't mean that we can't continue to post here and have fun, and keep the Lumi love alive and this board alive. If you have any suggestions of things you'd like to see please let me know. Before I take my break and before I hit the sack for the night I think its a great idea. Its summer time now just about, what about a beach theme? Its totally up to you. I think the lack of posting and other things going on are simply due to no Bryan to discuss. I PM'd some of my thoughts to you, Tink. I think a cooking thread and recipe thread would be awesome! I'll try to work on some other ideas this week-end. I would love to see some recipes posted! I am sure you are all great cooks. Well, thank you all for your support. I hope that people continue to post here. I want to keep the board up because I do love Lumi even if they aren't on anymore, you never know with the way things are going now. You are doing a great job, Tink! A summer theme would be great and, I'm sure, we'll all keep posting. heck yeah! we love you and we love this board! you bet we'll keep posting! you do an amazing job what with all the school, tests and so forth you have to do AND still run this place! you are the best! Absolutely Tink. We just don't say it often enough, but we all love you and everything that you do for us. Nala is so right Tink! You are the best. Hope you are doing okay, Tink. Oh thanks Maggie, I'm not doing so great. I'm all stressed out because it is my last week of school, and I have finals and big assignments due. I have procrastinated as usual. I will be done soon at least. You'll get through it tink. I have a lot to do this week as well and my sinuses are driving me nuts. Dr gave me a refill on antibiotics, hope it helps. Just think, school is out soon and we will all be able to relax. I am looking forward to it. Btw, my hubby is starting school next week. yayyyy! I will be talking to the school today to see if I can start in june, when work is out. Time to make some changes! Rose is doing better, she has her bad and good days - lately more good! She is starting to recognize people again and still loves the show. She thinks Lucas is just away working for Kate and I am not telling her different, so Nala if you talk to her don't mention BD is gone okay? Great to hear that Rose is doing okay, Mum! Tink, hang in there. It's all overwhelming now, but it will such a wonderful relief when it's over. here's a recepie of some yummy sticky muffins,and i hope i have translate it right..
"Wonderful chewy muffin with a taste of chocolate.! 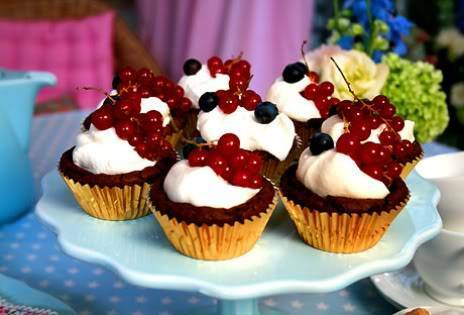 Serve with a dollop of cream and fresh berries cupcake is so perfect! 1st Set the oven to 175 degrees. 2nd Beat eggs, granulated sugar and vanilla sugar and white and quite fluffy. 3rd Melt butter, pour in cooking oil and syrup, mix it with egg mixture. 4th Mix flour, cocoa, baking powder and salt and fold gently into the batter. 5th Chop chocolate and melt it in a water bath (in a bowl over boiling water) and mix it with batter. 6th Place the paper in a muffin pan and fill the molds to 2 / 3 of batter. 7. 7th Bake them in middle of oven for about 12 min. Cupcake collapses in the middle when they are levied. Allow to cool. 8th Garnish with a dollop of whipped cream and fresh berries. They sound absolutely delicious, especially the chocolate part. Oh yum! Thanks Lumi! When I'm finished with my classes I will make some new threads and forums where we can discuss other things. I'm not quite done yet and I should be working now. I'm having such a hard time with my last paper and I don't want to do it. ttyl! It's almost over, Tink. I'm sure you'll ace your paper. my prayers are with you, Tink. I will light a candle for you. Good Luck Tink! I am sure you will do fine. Rose says hi to everyone! Thanks Lumi and everyone! Big group hug! I'm done. I'm not ready to celebrate just yet because my grades haven't come out. I'm just relieved that I've turned all my stuff in, I just don't know what to do with myself, I haven't had free time in a long time. I'll start working on doing some more fanart and maybe changing the colors of the board. Any suggestions or colors you'd like to see here? I appreciate your input and help. Luv ya, you all are the best. Btw, Lumi I sent you a pm here have you seen it? How about some yellowish background for summer? a beach theme, maybe? palm trees, beach and water, all that stuff. Subject: Re: What do you all think?